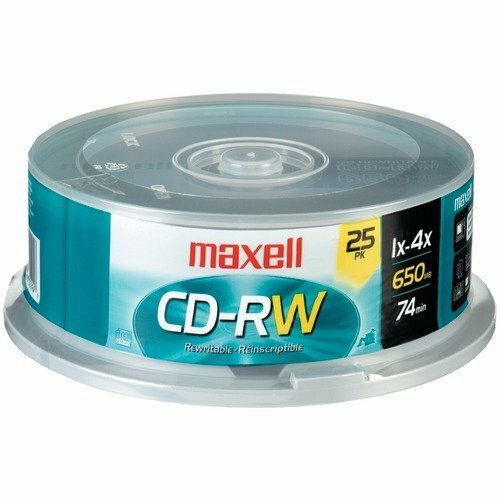 Maxell CD-RW Discs, 700MB/80min, 4x, Spindle, Silver, 25/Pack Rewritable disc offers convenience and quality. Premium recording surface ensures noise-free playback. Great choice for cost-effective data management; use for routine backups, authoring/editing multimedia projects, large file storage, and more. Share large files easily with associates, friends, and family. Durable media can be rewritten up to 1,000 times. Disk Type: CD-RW; Capacity (Music): 80 min; Recordable Format: Rewritable format--may record and re-record data up to 1,000 times. ; Capacity Range (Data): 700 MB. Cost-effective data management. Manufacturer's limited lifetime warranty.